If we learned anything about Brazilian fans this Olympics, it’s that they love the underdog (except when a Brazilian athlete is competing, of course). This meant a lot of booing for the dominant Team USA during the 2016 Olympic Games in Rio de Janeiro this August. 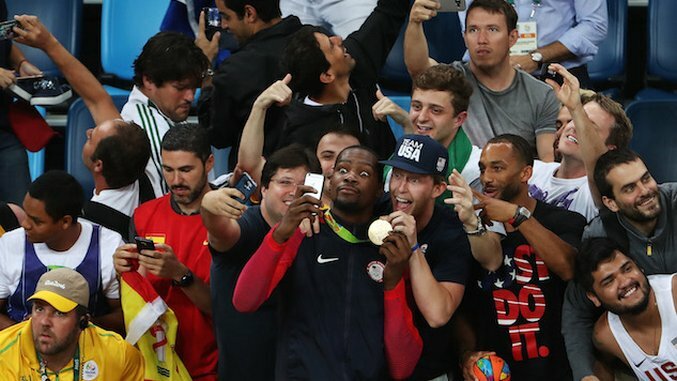 USA men’s basketball illustrated the peculiar allegiances of Brazilian fans. Many Brazilians are basketball fans—with a few Brazilians in the NBA, it’s gaining popularity in Brazil. The arrival of A-list NBA stars in Rio made a splash in local headlines; any USA men’s basketball game was a hot ticket. At the USA vs. Serbia men’s basketball in the preliminaries, fans were conflicted. With many fans wearing NBA jerseys, it seemed safe to assume that the locals would be cheering for the USA. But soon enough the crowds start chanting “Serbia! Serbia! Serbia!” Fans booed when the US shot free throws and applauded their failed shot attempts. But they also exploded in applause for Team USA’s impressive threes and dunks. The USA did win, although not by a landslide. Toward the end the crowd got heated with the idea of Serbia catching up to the Dream Team—they started cheering “We’re going to turn it around, Serbia!” But with a final score of 94 to 91, the underdogs couldn’t quite overcome. Then in the quarterfinals the US took on Argentina, Brazil’s long-time biggest sports rival. This time, the crowd was decidedly for the Americans, chanting their traditional soccer cheers, many of which aim to mock Argentina. “One thousand goals, one thousand goals,” the crowd roared, referring to Brazilian soccer legend Pelé’s lifetime goal tally. The chant goes on to snub Argentina’s Diego Maradona. “Only Pelé, only Pelé. Maradona coke-head,” jabbing at the soccer player’s history of drug addiction. “We didn’t understand what was going on,” American basketball player Paul George told journalists after the game. “We didn’t know if they were against each other or if they were cheering with each other” he said between laughs. Another Team USA player, Kyrie Irving of the Cleveland Cavaliers, commented that he loved the atmosphere and local fans. “We’re used to playing in arenas for 20,000 people. Soccer players compete for 100,000 people. I think today was closest I’ll ever feel to being a soccer player,” he said. But once Team USA took out Brazil’s archrival Argentina, the mix of boos and isolated cheers on impressive plays continued. In the semifinal against Spain, the crowd again went against the USA. “Brazilians cheer against the Americans because they think they’re arrogant,” he added, specifically referring to allegations that US swimmer Ryan Lochte lied about being robbed at gunpoint, when in reality he was drunk and vandalized a gas station. So when it comes to international sporting events, Brazilian audiences seem to have a rank: first and foremost, is Brazil, of course. Next, cheer for the underdog. Team USA is ranked pretty low on their list—though no one places below Argentina.